Biosynthesis of Antibiotics, Volume I focuses on research conducted on the properties, compositions, and chemical reactions of antibiotics. Composed of contributions of authors, the book discusses the microbial processes for the preparation of radioactive antibiotics. Areas of discussions include an introduction; microbial methods used in the preparation of radioactive antibiotics; and the presence of radioactive antibiotics prepared through microbial processes. 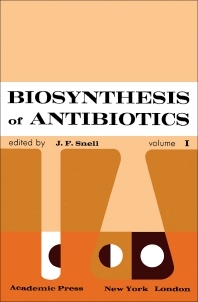 The volume also focuses on the biosynthesis of penicillin and cephalosporins. Areas of interest include biosynthesis of penicillins; penicillin acylases; and cephalosporin C biosynthesis. The text also provides information on the biosynthesis of tetracycline antibiotics, streptomycin, and macrolide antibiotics. Numerical representations and schematic diagrams are presented to show the properties, compositions, and chemical reactions of antibiotics when exposed to varying conditions. This volume is a great source of data for workers, graduate students, and faculties of biological sciences in the conduct of academic and industrial research.